Sometimes, husband's care can scare! Few days ago, when Mr. Hubby returned from a trip, he surprised us with the souvenir. Not one, not two but 12 Kg Mangoes! In the great Gabbar Singh's style, I said, "Aadmi 3.5 aur aam 12kg!" Haha! Well, MIL and I immediately got into the Mango mode. The refrigerator's vegetable basket was vacated for these guests, while the veggies made faces as they were given "Desh Nikala" and had to spend the night out in the warmth. 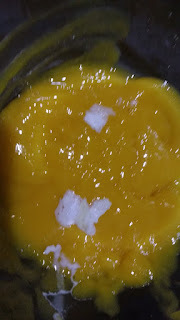 Such was the Mango pressure that till late night, all MIL and I discussed was how to use these Mangoes. 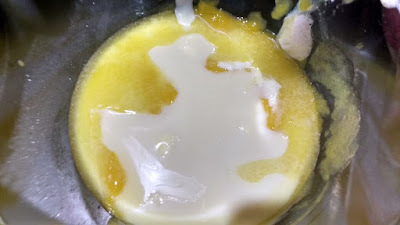 From Aam Panna to Mango ice cream, all options were explored. Next day being a Sunday, the baker in me came alive, as I had babysitter support (Mr. Hubby). "Let's bake a Mango Cake!" I suggested and my partner in crime, my MIL was too happy to help. 1. 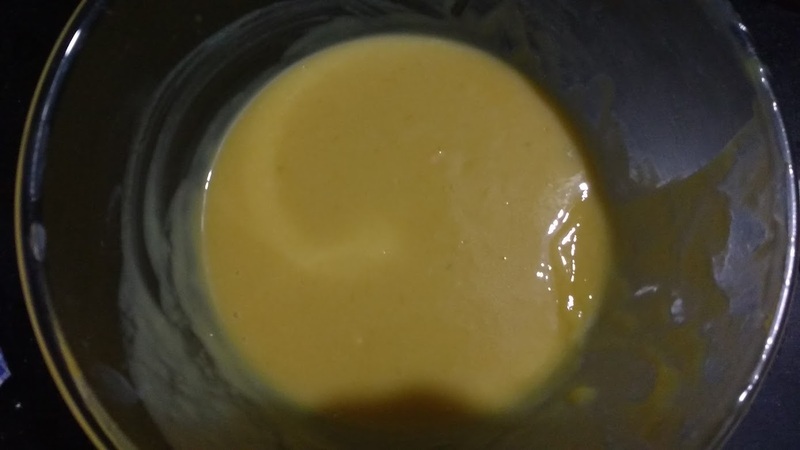 Take out the pulp from Mango and blend to a smooth puree along with the sugar. (The whitish thing in the pic is malai that accidentally dropped in the mixing bowl. 3. Sieve together the refined flour, baking powder and baking soda. 4. Add the sieved flour to the mango mixture and fold gently into a smooth batter. 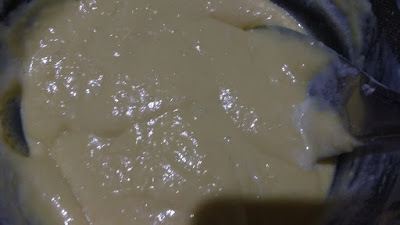 The batter should neither be too thin nor thick, just smooth flowing batter like the Pakoda/fritter batter. 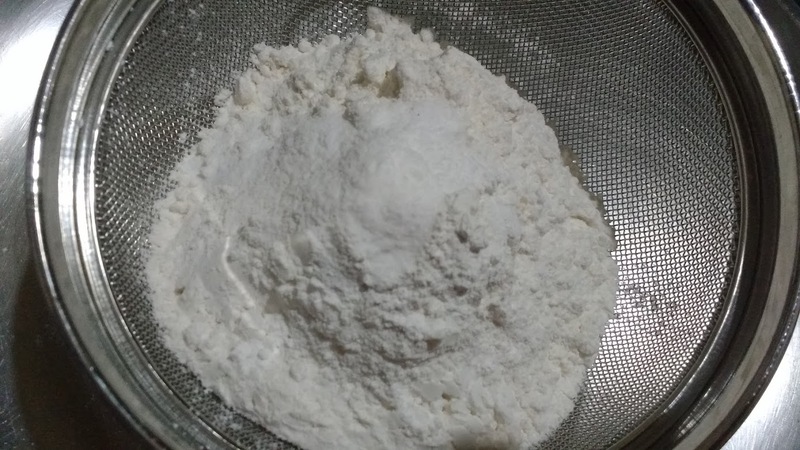 While the batter should be mixed well to avoid lumps, avoid over mixing as the cake won't rise then. 5. 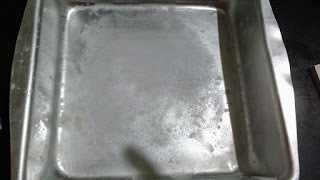 Grease an aluminium cake tin and dust some refined flour on the base as well as on sides. 6. 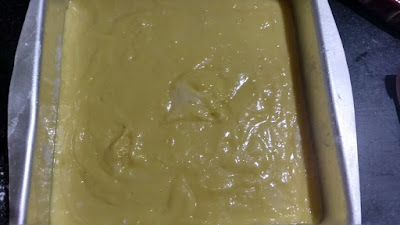 Pour the batter into the cake tin and level the batter with a spoon/by tapping the tin. 7. 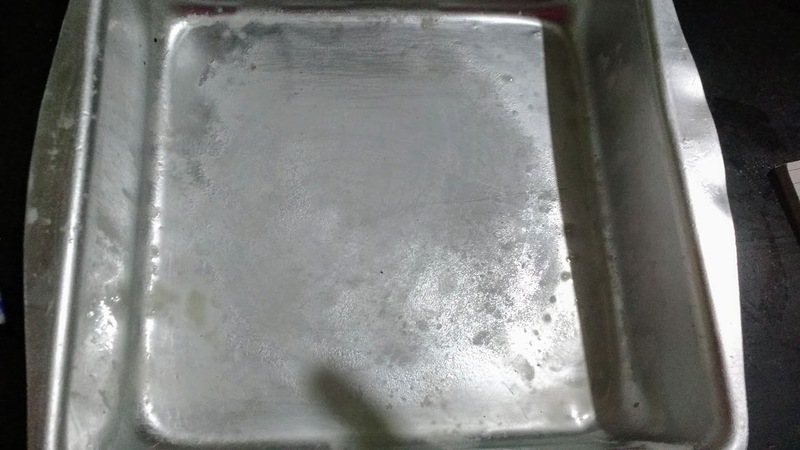 We had preheated the oven (convection mode in microwave) to 200 degrees since I have observed the temperature falls by 10-20 degrees while I place the tin inside the oven and set the temperature and time for baking. By the time I did so, the temperature had already fallen to 180 degrees which was the required temperature. Bake the cake at 180 degrees for 25 minutes. 8. Remove the cake and check by inserting a knife. If the knife comes clean, then the cake is done. 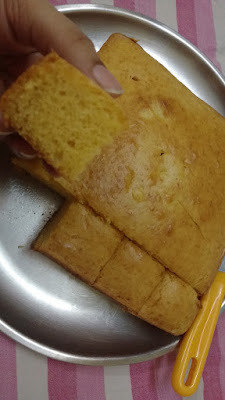 As you can see in the pic, I have stabbed the cake (as Mr. Hubby described it) right in the centre. 9. 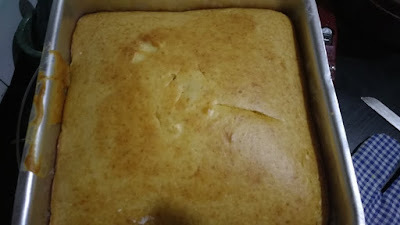 Cool for 20-25 minutes and enjoy with tea or with frosting of your choice. 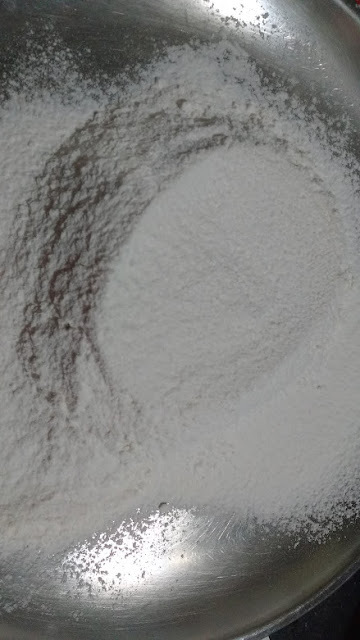 See for yourself how soft and fluffy the cake is! Lovely recipe! Definitely trying this out this summer as my fridge is stuffed with mangoes! 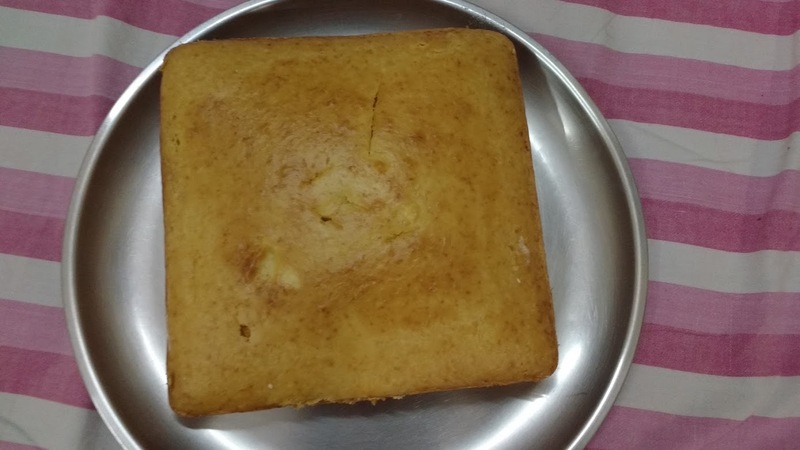 Shaivi you have written the whole post in such a story-telling manner that we the readers can feel the aroma of Mango cake wafting around and we are instantly tenpted to bake it right here , right now.